Designed by renowned Swiss architect Bernard Tschumi and notable Greek architect Michalis Photiadis, the Acropolis Museum captivates guests on approach. Its seamless modern lines elegantly incorporate artifacts exclusively from the Acropolis, and excavations are also visible under glass floors and walkways. The marbled surviving treasures are impressively displayed with the use of natural light, situated on a modernist open layout. Panoramic views top the experience. Beat the heat and the crowds by visiting the Acropolis in the afternoon. Entering on the south slope of the Acropolis, you’ll visit the Dionysus Sanctuary and Dionysus Theater before you walk up the slope leading to the Acropolis monuments. Panoramic views of the city will be perfect for Instagram-ready photos. 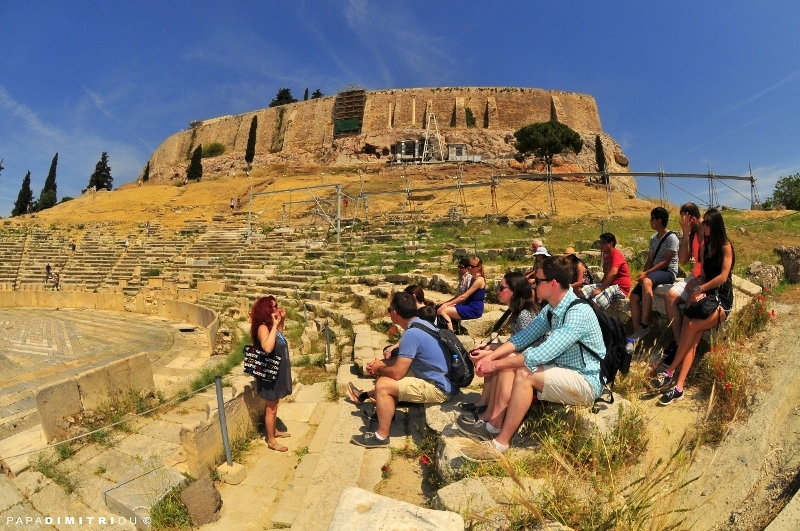 During your tour, you’ll gain insight into the significance of its historic monuments including the Parthenon, the Erechtheion, the Propylaia, the Nike Temple and other significant sights including the Odeon of Herodes Atticus, the Ancient Agora, the National Observatory of Athens and the city’s scenic hills: Filoppapos, Mars, and Pnyx. Entrance tickets are not included in the tour fee and the ticket costs will be owed to the tour guide before the tour begins. We save you time by buying entrance tickets in advance so you can skip the lines. This service is provided at no extra cost. Note that children under 18 years old have free admission to the Acropolis and all the archaeological sights. Through our free skip-the-line service, we buy the tickets for you in advance, so you don’t have to wait on line. This complimentary service gives you immediate access to the sights listed on the tour. We ask that you please make sure you have enough cash (euros) with you to purchase the tickets. During your tour, you’ll gain insight into the significance of its historic monuments including the Parthenon, the Erechtheion, the Propylaia, the Nike Temple. 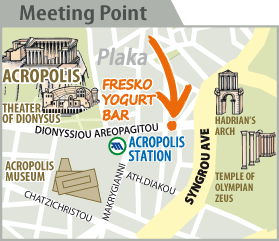 The meeting point is inside the Acropolis Museum, in front of the info desk. Please be at the meeting point 15 minutes before the start time of the tour. The entrance tickets are not included in the tours fee because there are various rates depending on participants (students, children etc. ), on the season (high, low) and there is free entrance on some specific dates throughout the year. However, we provide you with a skip-the line-service at no extra cost. We buy the tickets in advance so you skip the lines and have immediate access to the sights listed on the tour. Prices of the entrance tickets are subject to changes without prior notice. For more details, please check our entrance fees and tickets page. If you book a second tour with us, you are eligible for a 5% discount. Use the code SNDT at your booking process inside the promo code field. Discount code for families and groups (FMD): 5% discount to families/groups with 4 or more paying members. Discount code for groups of more than 4 participants with a second tour (SNDT+4): 10% discount to families or groups (4 or more paying members) booking more than one tours. For more information on discounts and special rates please read the FAQ ABOUT AWT.